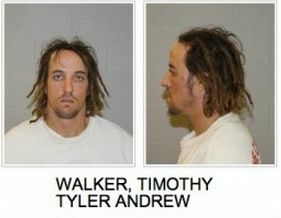 ST. GEORGE – Tuesday, 5th District Judge Eric Ludlow issued an arrest warrant for former NASCAR driver Timothy Tyler Andrew Walker after Walker failed to mail in his plea agreement or appear in court in lieu of the agreement. Walker was originally arrested after leading police on a high speed chase in January 2013. Defense attorney Trevor Terry told Ludlow that Walker had mailed in his plea agreement but accidentally mailed in the wrong agreement. Terry said he was expecting the correct plea agreement to arrive Tuesday afternoon, but Ludlow’s patience was short. This is the 13th time a resolution to this case has been stalled, and Walker has failed to mail in his plea multiple times. This led to a quick decision by Ludlow to issue a warrant for Walker’s arrest. Some of the delays in the case have been on the prosecution’s side as well as Walker’s, and Terry said he felt the judge’s frustration with Walker was misplaced. Charges against Walker stem from the January 2013 incident in which he is accused of fleeing from officers as well as drug possession. At the time, the Nevada Highway Patrol was alerted to be on the lookout for a reckless driver on northbound Interstate 15. Once the vehicle was located, a pursuit began, and one Nevada trooper clocked the car, a BMW, traveling at 140 mph. The BMW passed into Arizona and then into Utah, where the tires were spiked at Utah milepost 2 and all four tires were blown. The car then pulled over at milepost 6 and, once stopped, Walker attempted to flee on foot but was quickly subdued by an Arizona Highway Patrol trooper. His girlfriend at the time, Raelle McDonald, who was traveling with him, was taken into custody without incident. According to a UHP statement, a subsequent search of the BMW produced alleged methamphetamine, marijuana, drug paraphernalia and alcohol. Walker used to be a professional race car driver, having previously raced stock cars and trucks in various NASCAR races. He was suspended from racing in 2007 for violating the association’s drug policy. Isn’t it required to be a drunken hillbilly in order to be a nascar driver? That guy in Santa Clara wasn’t a nascar driver although he probably thought he was just before smashing into the wall. Otherwise, I think you correctly described him. Do not pass go do not collect 200 go directly to jail your get out of jail free card has been canceled. give up your railroads and Park Place and no more free parking for you because your not playing by the rules…. He was prettying himself up and lost track of time. Those dreadlocks don’t form into smelly clumps by themselves, you know.